so pretty :) i love it. Soooo beautiful, thanks for sharing with us. Can't wait to try it! Ohhh this is really cool! I've done this several times with braids, but it's a whole different look with twists! Ok I just discovered your blog and I LOVE your hair tutorials because they're so clear and you show the back the whole time! Most hair tutorials they are facing you and explaining it while they do it in the back of their head and you might as well just read the directions someplace. So thanks for your clear vids! 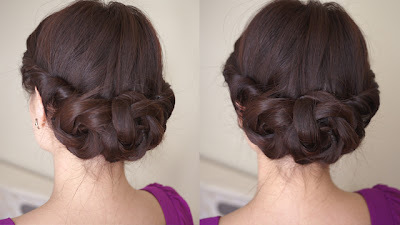 i love this hairstyle, i'll have to try it :) !!! tried it and LOVED it! got so many compliments! thank you so much! tried it, and LOVED it!!! got so many compliments! thank you soooo much!!! Thank you for the tutorial. Fantastic! Wonderful explanation. This is a style I might even be able to do. How can you tell where to put the bobby pins in the back of your head? Are you looking in a mirror behind you? Thanks again for the tutorial. Could you pleeeease explain how you secure your bobby pins? This is just lovely. Please please, could you explain how you secure your bobbypins? It looks like you twist them in some way? Love this hairstyle! C'est magnifique et a l'air si simple grâce à toi. Merci ! !